Known as one of the most beautiful cities in the world, Vancouver is especially charming in fall. Bright foliage rejuvenates the city, compensating for all-too-common rainy season. With these colorful pop-ups in the most unusual places, finding the best fall colors in Vancouver offers an utmost enjoyable experience. Fall is never late in Vancouver, British Columbia. And so are its incredible colors. Followed by perceptible temperature changes, the trees slowly change their colors from green to festive red, yellow, and orange. Needless to say, such transformation suits the city, making it look like a fairytale destination. A place that revives through the most amazing fall leaves possible. Hunting for the best fall colors in Vancouver starts in mid-September and last until early November. Moreover, this is also the best time to get outside and soak in last warm sunrays before the heavy rainfalls takes over followed by cold Canadian winter. With that being said, head straight to these six places where you can find the best fall colors in Vancouver. As the name implies, Queen Elizabeth Park has all things done according to the high royal standards. Same goes to finding the best fall colors in Vancouver. Scattered among evergreen trees, the yellow and red leaves slowly overpowers the park if not by the quantity then definitely by the color saturation. The dazzling foliage above your head and dense leafy blanket under your feet brings joy and happiness. Unexpectedly, long-forgotten childhood memories come back to life. Whether smitten by nostalgic feelings or the fall colors, you start throwing the vibrant leaves in the air. By this time you are completely convinced that Queen Elizabeth Park is one of the top locations to find the best fall colors in Vancouver. The biggest park in the city, Stanley Park does not ask for a specific time of the year to unfold its magnificence and natural beauty. But without exaggeration, we came to agree that it looks especially good during the fall season. The vivid shades of yellow, orange, and red fill the park, making it another top destination to find the best fall colors in Vancouver. 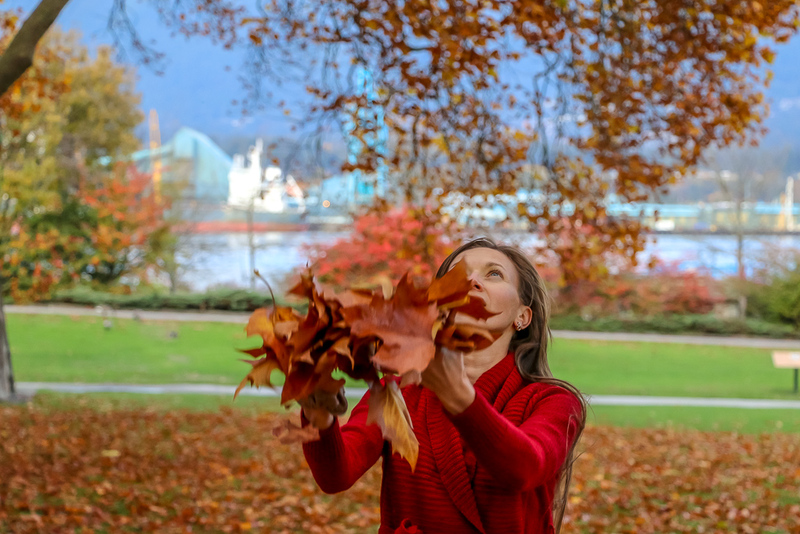 With all this abundance, Stanley Park is also a perfect place to resume your leaves’ game. Throw these vibrant colors in the air or make a custom-made (by a promising designer aka you) fall bouquet. Isn’t it fun? Furthermore, your fall portfolio will greatly benefit from such simple pleasures and extra pop-ups of colors. If you still long for different kind of fall coloration, pumpkin patch will come to your rescue. Located at Stanley Park Junction in Stanley Park, it is a great place to bring kids and have some fun fall activities. 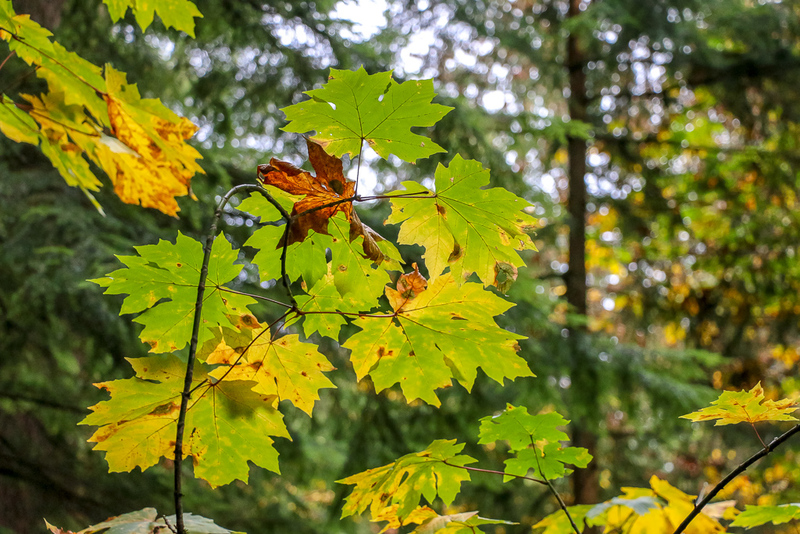 Known for the stunning Trout Lake, located in the middle of the park, John Hendry or Trout Lake Park is a dream destination for the best fall colors in Vancouver. And I dare to say this might come as an understatement. Thanks to its signature red trees, every fall Trout Lake Park wins over thousands and thousands hearts. Enticed by a spectacular seasonal show, the army of devoted visitors grows bigger with every passing fall. Would you even judge them after feeling fresh air and listening to crisp sound of the brightly colored leaves under your feet along the walkways firsthand? Surrounded by sweeping mountains, this Alaska-look like location is our next place with the best fall colors in Vancouver. 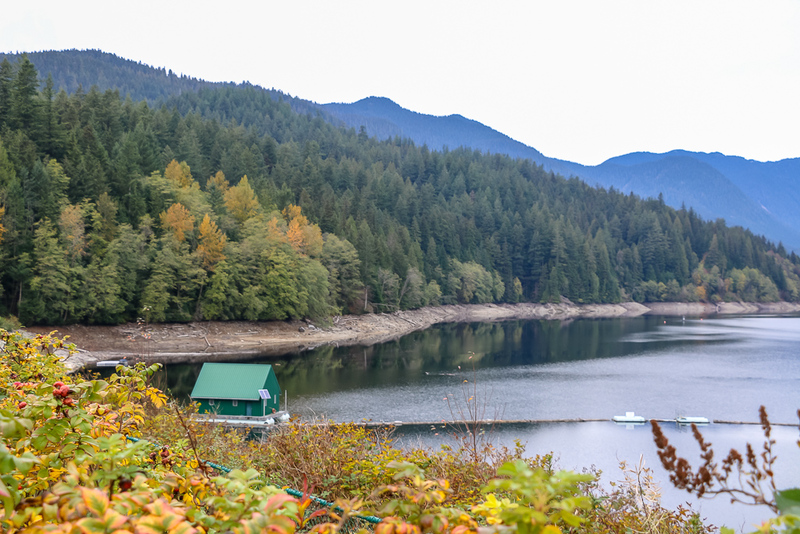 The stunning Capilano River Regional Park did not make its way to this list by accident. The incredibly bright foliage unveils itself way before you enter the park. Welcoming everybody without exception, the big red and yellow trees accompany the visitors down a wide pathway. To the right, the dazzling foliage intermingles with evergreen trees, creating a cascade of fall colors bursting from the mountains. If this is not perfection, then I do not know what is! Due to the abundance of pine trees, shrubs, and other evergreen coniferous trees, Capilano Suspension Bridge Park remains mostly green all year long. However, fall does not sleep, and the bright yellow and red colors slowly sneak into the park. Not particularly vivid at the entrance, the difference in the colors is most noticeable on the other side of Capilano Bridge. Sporadically covering the trees and the ground, they add extra charm and “spice” to the place. No playing with the leaves here, but gorgeous fall pictures are definitely guaranteed. And let us be honest, at some point, this is all we need from a destination with the best fall colors in Vancouver. 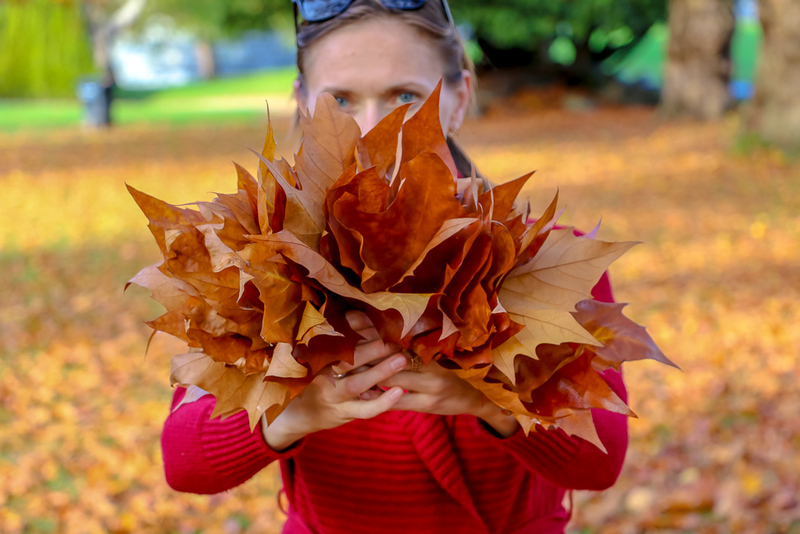 Our last place to find the best fall colors in Vancouver does not have a specific address. This destination is huge and can be located anywhere, especially in suburban area. With less skyscrapers and more space to grow the trees, the suburbs light up during the fall season. Rows of the red, yellow, and orange trees line up on the sides of the streets. Like a thick blanket, bright colorful leaves cover the road. Driven by the wind, the foliage flies from one place to another just to end up in a pile somewhere in the distance. When you look closely, you might be surprised to find one of these places near you. 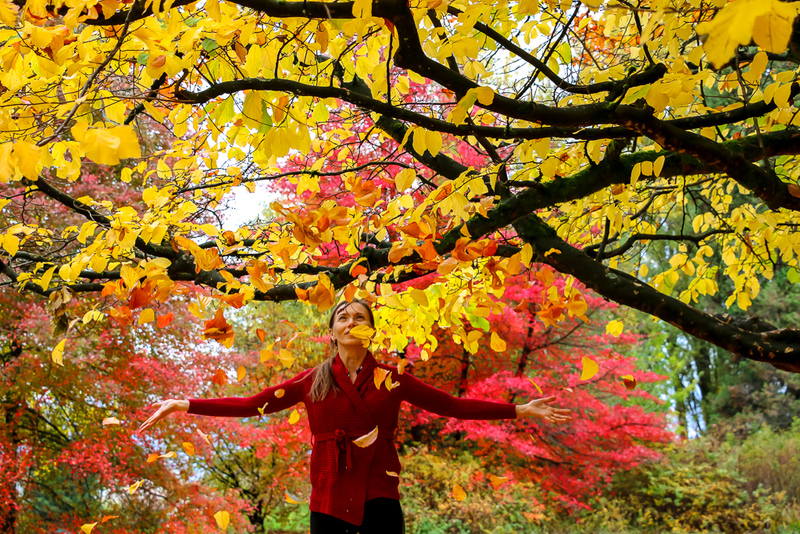 And if you are that lucky, then get outside and enjoy the mesmerizing fall colors of Vancouver. 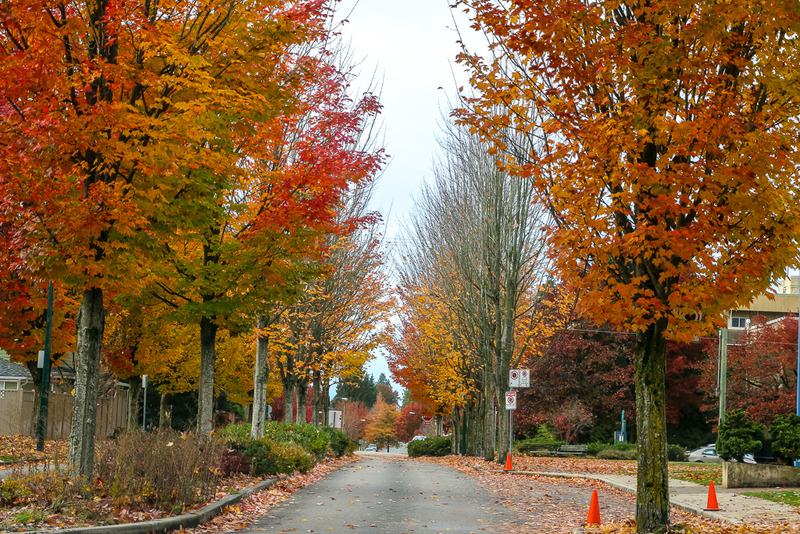 Whether you are an ardent fall fan or you passionately hate this season, these six places with the best fall colors in Vancouver will not let you stay indifferent. Share the joy of the glamorous time of the year with your beloved. Visit at least one or all of these places – you certainly will not regret it!